After two launch attempts, the mission has been scrubbed for today due to a faulty circuit breaker. NASA is rescheduling the launch for no earlier than Wednesday, Dec. 14 during a one-hour window that opens at 8:20 a.m. EST. CAPE CANAVERAL, Florida - The airborne launch of NASA’s Cyclone Global Navigation Satellite System (CYGNSS) spacecraft aboard a Pegasus rocket is scheduled for 8:24 a.m. EST on Monday December 12, 2016. The launch window remains open for one hour. About an hour prior to launch, the Pegasus rocket will take off from the Skid Strip runway at Cape Canaveral Air Force Station aboard Orbital ATK’s L-1011 aircraft, nicknamed “Stargazer.” The L-1011 airliner will carry Pegasus to an altitude of 39,000 feet over the Atlantic Ocean. 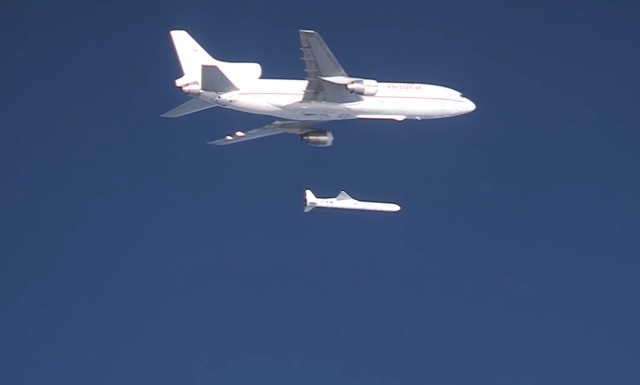 Five seconds after being dropped from the belly of the aircraft, Pegasus' solid-fueled first stage will ignite, propelling the rocket and its payload into outer space before second and third stage rockets take over to precisely position the eight micro-satellites. Once in orbit, CYGNSS will be the first scientific mission to probe the inner core of hurricanes in greater detail to better understand their rapid intensification. CYGNSS will make frequent and accurate measurements of ocean surface winds throughout the lifecycle of tropical storms and hurricanes. The CYGNSS constellation will measure surface winds in and near a hurricane’s inner core, including regions beneath the eyewall and intense inner rainbands that previously could not be measured from space. The latest forecast from the U.S. Air Force 45th Weather Squadron predicts a 60 percent chance of favorable launch weather. The primary weather concerns for launch are flight through precipitation and cumulus clouds.